Sarbaharapath | Siraj Sikder Works: Establish Independent East Bengal. The National Liberation War has started. Transform a Single Spark into Prairie Fire. Establish Independent, Democratic, Peaceful, Non-Aligned, Progressive Democratic Republic of East Bengal! The East Bengal workers movement with valuable experience of application of the universal truth of Marxism-Leninism-Mao Tsetung Thought to the concrete practice of East Bengal has firmly stepped up to the fourth year of its formation having open eyes to East Bengal and world. In these three years, the cadres of East Bengal Workers Movement have created epic of joy and sorrow with sacrifice and hard struggle and added a great glorious chapter in the history of revolutionary struggle of East Bengal. 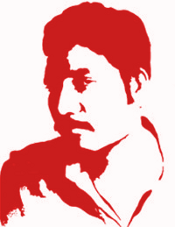 With the influence of Chairman Mao-led anti-revisionist struggle of world proletariat and revolutionaries, the proletarian revolutionaries of East Bengal rebelled against different forms of revisionists of East Bengal by upholding the flag of ‘It’s right to rebel’ and established the East Bengal Workers Movement, the preparatory organization of an appropriate political party of the working class of East Bengal. Since the moment of formation, the East Bengal Workers Movement has been carrying uncompromising struggle against different forms of revisionism and petit bourgeoisie ideology and its manifestations, and at the same time, in the course of revolutionary practice, prepared the correct political line of national liberation of East Bengal, at the present stage of protracted people’s war, the correct military line of initiating guerrilla war by annihilation of national enemies and a correct organizational line of building organization clandestinely on the basis of democratic centralism. The cadres of the East Bengal Workers Movement have become further matured in the course of study and practice of Marxism-Leninism-Mao Tsetung thought, merger with workers and peasants and being steeled in revolutionary ups and downs; they are carrying revolutionary work with more efficiency. These three years’ revolutionary practice of East Bengal Workers Movement created the subjective preparation for initiating and carrying armed struggle. As a result of that, the guerrillas of East Bengal Workers Movement successfully carried commando attack upon Pakistan Council Center, Office and US Information Center, and initiated the armed resistance in the history of revolutionary movement of East Bengal. The colonial military regime of Pakistan was terrified with a pin-drop and became mad dog to uproot the East Bengal workers movement in its blossom. The different forms of revisionist lackeys, the right-wing and the left-in-form right-in-essence reactionaries of East Bengal merged in that hated effort. The colonial regime of Pakistan has arrested many of the best sons and daughters of East Bengal who work with East Bengal workers movement and declared reward for arrest many. The flesh and blood of East Bengal people, these best sons and daughters of East Bengal are suffering endless torture and difficulties inside prison. When we remember them our heart aches and eyes shed tears. The cadres of East Bengal workers movement transformed shock into intense hatred against the enemy, tears into thunder hard determination to smash the enemy, consolidated and reorganized own strength, redoubled revolutionary work and expanded armed struggle in rural areas. The guerrillas of East Bengal Workers Movement have successfully initiated guerrilla war for the first time in East Bengal through national enemy annihilation in Chittagong, the place of Surya Sen and in Mymensingh, the place of Sannyasi rebellion and brought a new chapter in the history of revolutionary struggle. In 1970, the East Bengal workers movement, in its development, entered into the historic stage of armed struggle. The contradiction of East Bengal people with non-Bengali Pakistani ruling regime is intensifying each and every day. The death of hundreds of thousands of people in the most serious cyclone and tidal upsurge ever proved the dominated character of East Bengal. The Pakistani colonial military regime is conspiring to mislead the East Bengal people’s struggle for national independence, liberation and separation to the black path of legal peaceful struggle, and with that aim, they have held election under military rule and legal framework. The Awami League, by not directing people against that, has joined that conspiracy and is saying of peaceful and reformist path and democratic socialism as the solution to the exploitation and suppression over East Bengal. The main element of power of non-Bengali regime of Pakistan is its military force. It is not possible to do any good to the people of East Bengal without defeating and smashing this anti-people armed force via armed struggle. The end result of all the peaceful, legal and reformist efforts are compromise, collusion and betray to the interest of people. So, the two paths, the one of armed struggle and the other of compromise lie in front of Awami League. The class basis of Awami League proves that it is following the latter, the end result of which is betraying with the interest of people. The Awami League wants to establish the so-called democratic socialism by nationalizing several institutions. Without the political party of the proletariat and the proletarian dictatorship that is led through it, the essence of all other forms of socialism is state capitalism. Other than people, it protects the interest of corrupt bureaucrats and managers etc. The end result of that are Loss Corporation EPRTC or EPIDC and other government corporations. This is a new tactics to resist Communism by the chieftains of the so-called free world the US imperialism and their lackeys. Ne-Win of Burma, Li-Kan-We of Singapore and Indira Gandhi of India, in the name of building socialism in own methods are intensifying older exploitation in the form of new exploitation and they are continuing massacre over communists. But they are not being able to resist communism. People’s revolutionary struggle is bursting out with fierce rage. Sheikh Mujiv, by saying socialism and ending of exploitation, as a bandit gang of US imperialism and Pakistani colonial ruling regime and reactionaries, is trying to ‘bury alive’ peasants-workers-masses and their leadership of East Bengal, and at the same time, trying to play the role of Chian-Ki-Shek, Ne-Win, Indira and Li-Kan-We of East Bengal. This is why the Pakistan colonial military ruling regime, by giving them some concession, conspiring to smash the East Bengal revolutionary-led independence struggle by the Bengalis. Today or tomorrow, history shall finally bury all the clowns and cheaters. Moved by the revolutionary masses of East Bengal, the chariot of history has held Sheikh Mujiv and Awami League high to the peak, what will inevitably in its own path, will smash and bury them. We must always put this truth forward in front of people and strengthen effort to unify with us the people who are illusioned by the rising bourgeoisie because of the betrayal of different forms of revisionists. With that aim, we shall strengthen the agrarian annihilation campaign against the national enemies in rural areas. Thus, we shall achieve leadership of eighty percent people of East Bengal, and that of the urban intellectual, the working class and the national bourgeoisie via that. The present international situation is very much suitable for revolution. Great leader chairman Mao very much correctly has summed up the experience of the revolutionary struggle of the present world, “Revolution is the main trend of present world”. The revolutionaries of the world are rapidly advancing towards final victory. The flames of the liberation struggles of the oppressed nations of Vietnam, Laos, Cambodia, Thai Land, Burma, India, Palestine and Asia-Africa-Latin America are roaring. In the very heart of the US imperialism, armed struggle is being strengthened against the violent suppression of black inhabitants. Mass unrest and internal contradiction is intensifying among the Soviet Social imperialist-led revisionist countries. They are also waiting for own destruction. On the other side, the People’s China under Chairman Mao’s leadership is standing like a giant in the eastern horizon. In Europe, the Socialist beacon Albania is shedding bright light. 1) Different forms of revisionists: the Moni Singh-Mozaffar revisionists, the Huq-Toha neo-revisionists, the Deben-Motin Trotskyte-Gueverists, the Kaji-Rono conspirators, Agni Prova Maiti etc who are different in forms but in essence revisionist. 2) Right-wing reactionaries of East Bengal: all fractions of the Muslim League, the PDP, the Jamat, all the other religion based parties and a section of the Awami League leadership.